You are going to Watch One Piece Episode 379 English dubbed online free episodes with HQ / high quality. Stream Anime One Piece Episode 379 Online English dub Brook’s Past! A Sad Farewell with His Cheerful Comrade!Brook recalls his past, when the whale Laboon started following his pirate ship and befriended the crew. 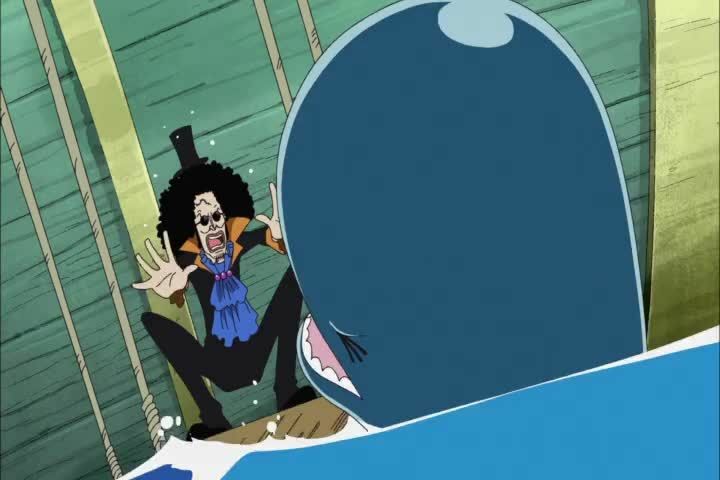 When the crew headed toward the Grand Line, they had no choice but to leave Laboon behind because the danger the sea would present to a young whale like him, but Laboon followed them over Reverse Mountain, anyway. Brook and his captain convince Laboon to stay behind, promising that after they traveled through the entire Grand Line and he grew strong enough to follow them, they would come back and bring him on their adventures. They were unable to fulfill the promise, though.